One day we found evidence that a mouse had been in our kitchen. We cleaned up everything and set up a trap. Later that day I had a meal that included little black seeds in it. Bad choice. Also, Xmas is almost here! Only a few days left to have a package full of Biff sent your way before the year is up! I’m vegetarian. Once my stepfather ordered a sesame-seed bun-ned chicken schnitzel. They were the only thing I didn’t refuse to eat. Mice used to live in the walls right next to my bed. They would scratch, and scratch, and scratch into the night. I wouldn’t tell anyone because I didn’t want anyone to kill them, so eventually I started sneaking into the passageway to sleep in the dead of night. I’d give you more pointless stories (this brought up about five memories), but I doubt you’re interested. BTW, if Biff did ask for sesame seeds, send it back. 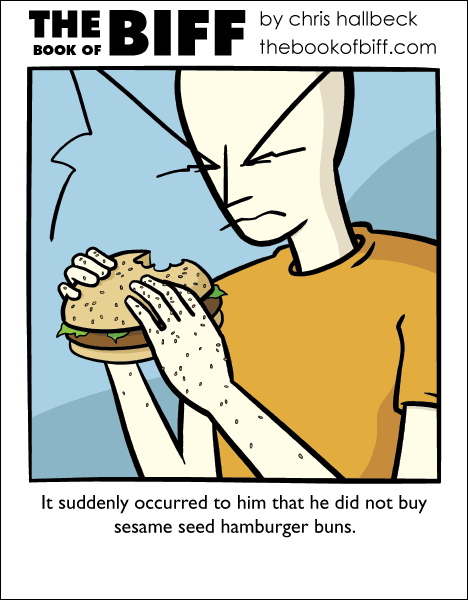 That is clearly more resembling a poppy seed bun. Added seasoning week… mice are such messy creatures for their size. I keep mothballs in my silverware drawer to prevent massive rewashing episodes if they ever revisit. I used to feed the birds near the house now I do it much farther away so the field mice risk owl kill rather than reaching my house walls. Oh, I see. It was just a question of resolution and superficial reading. For some reason I thought those were solid black and were supposed to be ants. I do see the yellow centers on closer inspection. Meally bugs do rate a slightly greater “Ewwww” factor than ants. Ewwwwww! This brings back far too many memories of my high school cafeteria. Yes, there were times lunch moved on its own. …the only difference is my dotdotdot-ing! …and THAT’S the end of THAT chapter. Lol it tasted good though!